My musings here almost always begin from objects— strange objects, often. 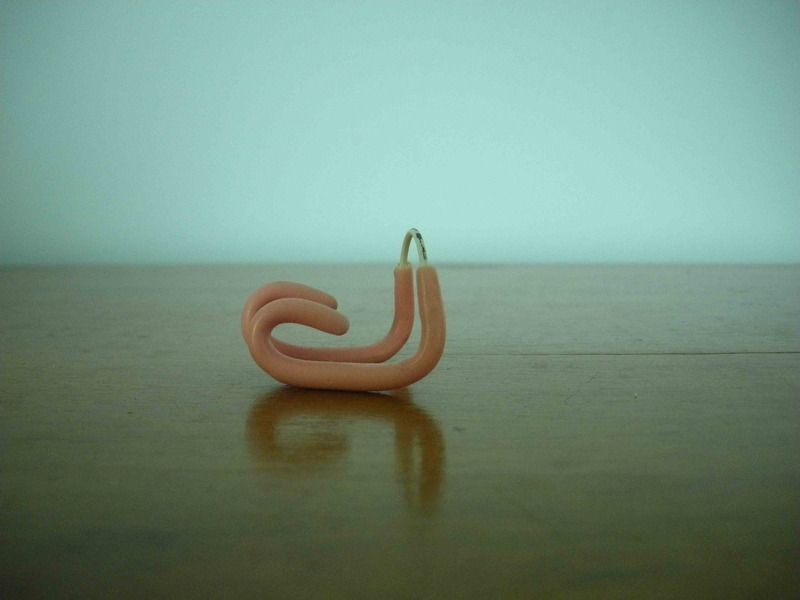 This is a nose clip, used by synchronized swimmers. The bookstore at my high school sold them in plastic packets; that fact seems stranger now than it did then. This one reappeared in my life in a box full of stuff that my mother culled from the bedroom that is no longer mine: a room almost as large as my own house that conceals (behind louvered doors) the material traces of all kinds of memories, pleasant and sometimes bitter. Time, though, has begun to dull most of those sensations into a simple haze of nostalgia. In another life, I was an indifferent synchronized swimmer; indifferent in terms of the degree of my skill and also in my dedication to gelatin-slicked hairdos, coordinated bathing suits, and full leg extensions with perfectly pointed toes. My high school experience was more bizarre, even, than most. We performed shows on one weekend of each year, swirling through the water in formations like spinning blossoms: the unremarkable pool was transformed, through our labor, into a set with doors where we would come and go, delivering dull bits of dialogue— “Wake Up, Little Susie!”— and stitching together a plot through the titles of the unobjectionable songs to which we swam. One year, I think we were in the Arctic: I remember how the faux-fur trim on our plastic capelets (worn between turns in the pool, to provide the illusion of a frigid setting where one could not simply wander about in a modest bathing suit) stuck to my wet skin. The next year was Mardi Gras; we wore suits of an almost universally unflattering orange hue. My career as a synchronized swimmer, sadly, was cut short after only two years: although, to my knowledge, dance cards, etiquette dinners, and other vestiges of the Antebellum Era are still going strong, my curious Alma mater determined that water ballet was no longer à la mode (this realization came to them in 1999, roughly half a century after it reached the rest of the world). I tip backwards like a bird diving for a fish, tucking my knees to my chest before extending one leg upwards, furiously but invisibly treading water with my hands while straining (without seeming to strain at all) to reach my leg high and straight, toes pointed towards the sky as though I still fear the rebukes that came too often from the general direction of a pair of sensible shoes standing on the deck of the pool. I twist and turn through sequences of log rolls, ballet legs, dolphins and half-twists; these motions come freely now, the pure release of muscle memory logged in long hours more than a decade ago. Compared to many of the elegant swimmers on our team, I was always a second-rate water ballerina: everyone’s high school years are filled with feelings of insecurity, but I think they seldom take the exact same form as that worry. But now, I’m almost certainly the best synchronized swimmer in any given pool. I’ve never met another one. u r weird & lovely. this is actually a really compelling little memoir!